[Satnews] UAE-based satellite operator Yahsat announced during the Latin America Satellite Congress a contract award to Newtec for the delivery of service platforms and operating systems in support of the company’s planned extension across Brazil in 2017. 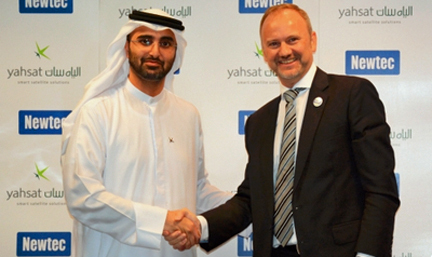 Masood M. Sharif Mahmood, Chief Executive Officer at Yahsat, and Serge Van Herck, CEO at Newtec, at the signing of the two companies' agreement. Yahsat has awarded a new contract to Newtec for their Newtec Dialog® multiservice VSAT platform, including VSAT baseband hubs, user terminals, as well as the Operating Support System (OSS) and Business Support System (BSS). The contract also caters for the supply of various types of Customer Premise Equipment (CPE). The turnkey solution provided by Newtec, in partnership with Tech Mahindra, is integrated with an Oracle platform, bringing Tier-1 capabilities to the OSS/BSS layer. Tech Mahindra comes with more than 20 years of experience in delivering OSS/BSS solutions to global telecom operators and has a strong presence in Brazil. This partnership intends to maximize flexibility and innovation and will allow Yahsat and its customers to benefit from a broader product range and wider implementation, better serving the needs of its various markets—from consumer and enterprise broadband customers, to the provision of backhaul services for telecom operators and ISPs. Yahsat’s third satellite, Al Yah 3, is scheduled for service launch in early 2017, extending the company’s commercial Ka-band coverage to an additional 19 countries and 600 million users across Brazil and Africa. Al Yah 3 will cover more than 95% of Brazil’s population. This latest partnership is in preparation for these developments, and is in line with Yahsat’s strategy to appeal to wider demographics in the markets in which it operates. While Newtec is the preferred partner for the Brazilian market, the Newtec platform may also be deployed in other territories across Yahsat’s footprint. The partnership reinforces Yahsat’s commitment to expanding its footprint in growing markets, strengthening Yahsat’s position as the world’s eighth largest operator in terms of revenue. David Murphy, Yahsat Chief Commercial Officer, said, "This latest contract award to Newtec signifies the first time a satellite operator is set to integrate a fully-fledged OSS/BSS into the VSAT service platform for both wholesale and consumer segments. By doing so, we are extending our service offering and ensuring a high level of customer experience for all." Marcio Tiago, Yahsat’s Brazil Country Director, said, "Yahsat is committed to addressing the market needs across Brazil by implementing a best-in-class platform, coupled with a flexible OSS/BSS platform, which together provide greater capacity and functionality for a wide range of customers. Yahsat’s pre-defined high-speed broadband bundles will provide speeds up to 15-20 Mbps, while the platform will also enable customized solutions to meet wholesale and corporate requirements."